You are absolutely correct. It is ‘individual share capital in excess of 2 lakhs’. Here, it’s not the actual share price which is considered but the face value of the share. For a share of face value 10, someone holding more than 20k shares will come in the list. For a share of face value 5, someone holding more than 40k shares will be included in that category. And for a share of face value 2, some one holding more than 1 lakh shares will be included in the list. Very good result by KSE Ltd.
Oil cake processing division has done best. Diary division is doing very good but small part of overall sales and profits. If anyone can prepare rough estimates of the flood effects on KSE Ltd! Please share. This share is rarely discussed publicly on TV, article Online. I don’t know the about the damage. For the last 15 years we are the stockist and supplier of there cattle feeds. Inventories are not affected badly from the floods.Because yesterday we ordered for 300 bag of cattle feeds 50kg per bag And today it got delivered.We are a leading supplier of cattle feeds and grocessry items in central Kerala.We yesterday ordered for various grocessory and cattle feeds items from various companies across Kerala.But only kse delivered their items promptly.I think kse doesn’t got affected from this flood. There factory in kottayam district is working normally. KSE Ltd has issued clarification on Kerala flood. Almost all plants are safe. Only Rs 15 lakhs of items perished. How much Animal feed sales will get impacted is not calculated yet as farmers lost everything in the flood. We have nine production units and one sales depot in Kerala. Though the flood was widespread all over Kerala, all our Units are safe and there was no damage to production facilities. Only we have lost some milk and ice cream worth about Rs. 15 lakhs in Konikkara Dairy Unit, wherein a small portion of the plant was under water for a few days. All the other plants and stock are safe and we taking regular production. As our entire assets are insured, we will be putting our claim for the loss of milk and ice cream with the insurance company in due course. It is too early to predict the impact of the flood on the volume of our feed sales. Many farmers had lost their homes, cattle and all their life-long savings. The number of cattle dead in the flood is not known. At this stage, we are not expecting any considerable impact on our overall feed sales. Kindly arrange to announce the above to the members. We also take this opportunity to request all the investor community to contribute liberally to the Kerala Chief Minister’s Distress Relief Fund and help to build back the flood-wrecked Kerala. On the preliminary estimate, the fund required for the recovery of the State of Kerala is stated around Rs. 20,000 Crores. Your Company will be incurring a total expense of around Rs. 2 Crores on account of flood relief. Disclosure: invested and sitting on loss of 20%. KSE is the largest manufacturer of compound cattle feed in private sector in the country, focused only in Kerala. It has emerged as a leader in the ready mixed cattle feed industry in the country. Today KSE manufactures a range of livestock feed in high volumes, coconut oil from coconut oil cake and refined edible oil. It has also entered the field of milk procurement and processing – A) KS Milk, B) KS Ghee and C) Vesta Ice Cream have become popular in many districts in Kerala. KSE operates in broadly three segments – Animal Feeds (78% of Revenues in FY18), Oil Cake Processing (20%) and dairy (2%). The mix has been stable over the years; however, Oil Cake Processing is the most lucrative business with ~13% operating margins compared to ~6-7% in animal feeds and breakeven in the dairy segment. KSE did Rs.1,304 Cr revenues in FY18, up 24.5% from FY17 led by higher feeds sale due to lowered prices but higher volumes (prices declined by ~10%, volumes up by ~33%). It has grown at a CAGR for ~13.5% during the last 5 years. PAT was at Rs. 70 Cr, up more than 326% due to higher operating leverage in both feeds and cake processing division. It has increased at a CAGR of 73% during the last 5 years. KSE has improved incremental return on capital to ~40% in FY18 from ~16% in previous years. However, it operated at ~35% in F12-14 and it looks like to be moving in cycles. The key would be to monitor the incremental ROC going forward on a quarterly basis. Return on Equity is at 60% and has moved between 10% to 70% in last 4 years, in line with prices of feed input. But then, KSE has grown by ~13% during the last 5 years – The growth in KSE revenues are a direct result of growth in milk prices, which in turn impact the purchasing power of farmers. How much of the market can KSE capture? Valuation and what should we do? What are the key risks and concerns? It is a one state wonder and until and unless it manages to grow in other states, there is a probability of it hitting a growth roadblock – We will get out in this case. And this is precisely the reason we need to build margin of safety by not paying for any new growth! I think next 3-4 quarters are not going to be great. Hopefully stocks dont take a beating. Someone on Telegram app with a good following issued a buy recommendation today so it went up quite a bit but I am not sure if the bottom is reached yet. It sells in TN and some part of Karnataka also along with Kerela as you have mentioned. Looks like a leading money magazine recommended KSE today with Rs 3900 as target price. If sales loss is not more than 20% then I will try to add more. Will see in coming quarter result. Yes, but profit is down by 50%. That could be due selling on credit to help farmers and retain customers. If management could tell us about when flood effects could be neutralized then that would add clarity. Some growth prospect could help in running of the stock. Now, I am tired of waiting. Big amount stuck here. brilliant summation! my compliments. . .
however, without getting into too complex analysis of valuations, let’s alternatively, simplify the whole overview: everything said and done, in a nutshell, essentially KSE is a function of (1) raw material prices and (2) feed / oil sale prices. . . . and as it seems the COMPANY HAS NO MUCH CONTROL OVER EITHER OF THEM!! the rise and fall in the prices of RM directly affect them and they have no particular insulation against it.
" …because of the good monsoon rain across the country, we expect a good crop for the next season and that the prices will fall in line. The prices of ingredients are thus likely to fall by December, 2018. Until such time, there is likely to be a reduction in the profits in the animal feed division for the next two quarters…"
So BUYING THIS SCRIP IS AKIN TO ‘WAITING TO GET LUCKY’ that the RM prices fall, weather is normal, fuel prices do not go up, Forex prices remain stable, market prices stay normal, competition doesn’t reduce prices and so on. . .
the management holding is low and is gradually reducing over the years. this year (ref. 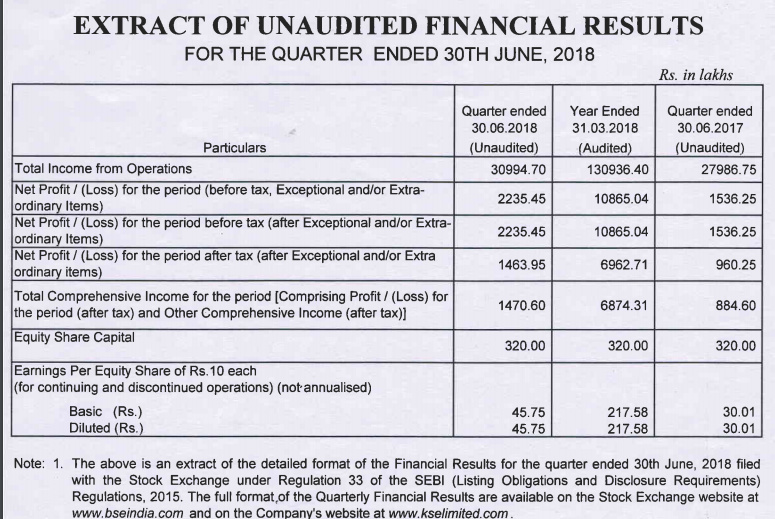 result of AGM) the shareholders voted against and did not let adopt the resolution of re-appointment of AP George and increase in his salary, and also rejected proposal to transfer 71 lacs (25 lacs depreciated value) worth of Mercedes car to ex. MD’s wife, posthumously, in reward to his long yrs of service. So, all-in-all in my humble opinion THIS SCRIPT DOESN’T SEEM TO BE A MULTI-BAGGER CANDIDATE. It at best would sway up and down with a variety of factors. Its commoditization / cyclical. And with no real new triggers or any assurance of improving margins, there’s no PE re-rating expected. . . one can have a view to buying for mean reversions i.e. buy on low PE in 10s and then sell on high on PE in 20s. . . Accordingly, at current PE of 9.50 it does merit a close watch. . . Any further reduction in MCAP / PE in next quarter on a/c of poor sales as expected from August weather impact and rising cost of raw materials could give a good entry for at least 2x gains in mid-term /12-18 months.
. . . my two pennies! Do you own any view on Raw material especially Rice Husk and Maize? Other thing is recovery from flood. Every company has variables. Established company used to manage some. I am sitting on huge loss and want to take call whether to sell or hold. Agri price is stable from few years but I am unable to find any report regarding Rise and Maize. Also, no new report I have on sales and margin after Kerala flood. I see KRBL and ChamanLal setia has not gained in price. Can I assume that rise price won’t rise! Is the question to me? . . . well i am not capable to reply on this. sry. Yes, it was too you. Sometimes, Stock just go down without any reason. Currently, the situation is same here! Logical mind say, I am safe at this price point but then falling each day from so long takes away power.